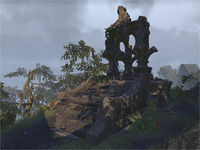 Xal Haj-Ei Shrine is a shrine in northern Shadowfen, east of Stormhold. The shrine is home to a special crafting site, where you may craft items in the Magnus' Gift set. According to Morrowind, "Haj-Ei" is Argonian for "Hides His Eyes".